Mix the all purpose flour, baking powder, salt and anise seeds in a large mixing bowl. Toss in the butter chunks and the vegetable shortening in spoonfuls. Begin to mix it with your hands, until the butter and vegetable shortening are mixed in with the rest of the ingredients. Add the sugar, egg yolks and warm water, working everything together with your hands. In less than a minute, the dough should be soft and malleable enough to be turned into a ball. Don’t knead it more than necessary, as soon as it all comes together in a homogeneous mass it is good enough. Butter a large cookie sheet. Preheat the oven to 350 degrees. One by one, make cookie balls with the palms of your hands, of about 1 1/2″. Then roll it out either with your hands or on a lightly floured surface, into a short rope form, of about 3 to 4″ long and less than 1″ wide. Twist the rope a bit and close the two ends making a loop. It is very easy! Like a doughnut shape! 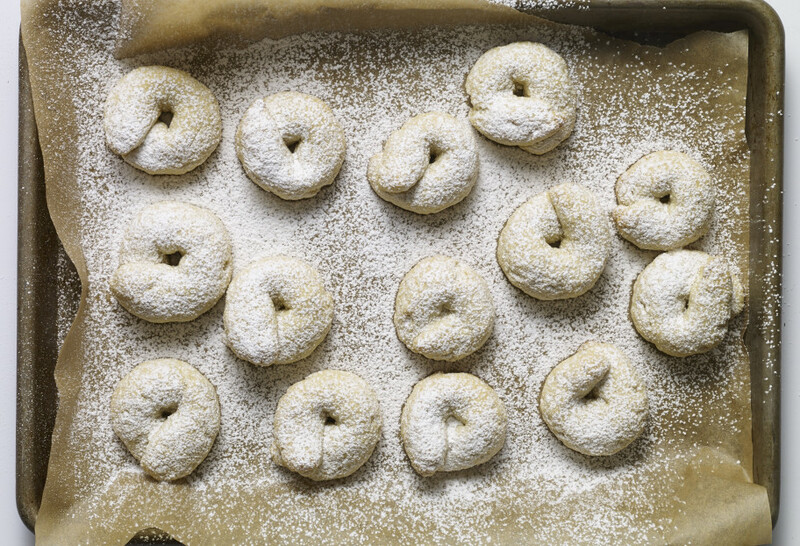 Place the finished rosquitas on a buttered cookie sheet until you have finished the dough. Place them in the oven anywhere from 20 to 25 minutes, or until cooked and lightly browned on top. Remove them from the oven, let them cool, and sprinkle with confectioners’ sugar.